Don’t know, don’t care. I know some people LOVE mushrooms, not me. Blah! That mushroom isn’t going to last long with that killer leaf about to ensnare it in a death grip. ‘Tis a verdigris toadstool. 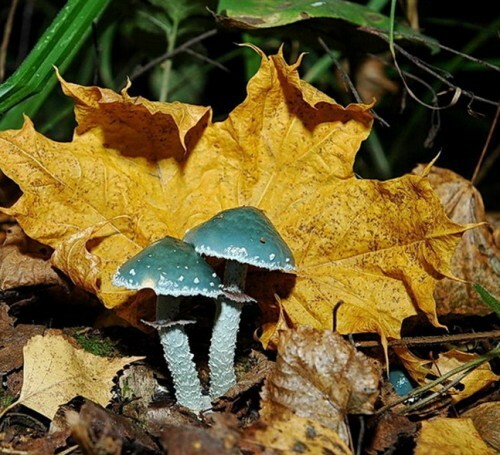 contains a small amount of psilocybin, which is a hallucinogenic. Not recommended for eating……or is it? Destroying angels (amanita ocreata) are white, Death caps (amanita phalloides) are usually a greyish green color in my region (southern NY)but can vary depending on substrate and rainfall. With this, as with all myco’s, bring a lunch buddy. Feed him the test mushroom. If he doesn’t suffer liver failure 3-4 days later, its safe.